We focus on providing private parties with moral entertainment through shows that are provided by strong professional actors. For celebrating your religious or family events, we provide entertainment to bring the family together with friends in a morally positive environment. You need a group that can provide entertainment that can match the occasion and use aspects of the event in the content of the performance. With a variety of game shows, improv comedy and murder mystery dinners available to fit most any need, it's no wonder that so many families have appreciated the options we can bring to your special occasions. Nothing makes a private party or banquet for faith-based entertainment more successful than improv comedy. Whether you are trying to impress your boss or your family, nothing spreads a good time like a show with some of your area's top clean improvisational comedians. THEY have earned a reputation for making people laugh under almost any circumstance. THEY can mill about within a private party and entertain from within or take the stage and entrance the audience with daring feats of family-friendly humor made up on the spot. THEY also have top-notch comedy writers on staff that can come up with topical on-point comedy for your church or temple meetings. These sketches can entertain while educating to religious doctrine or simply express particular moral values. We can show by way of example, or cautionary tales of the path that shouldn't be taken. Either can lead to hilarity while portraying a desired ethical ideal. If you are looking for something to entertain for a holiday, we can help with creative ideas. Besides Christmas, New Years Eve and Halloween, we can develop programs for everything from Arbor Day to the Summer Solstice. 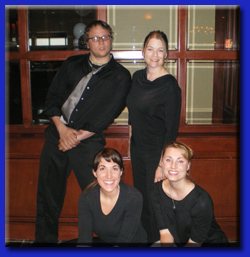 With a collection of improv comedy game shows and murder mystery dinners, THEY improv works with you to develop a program that will meet your needs within your budgetary constraints. THEY improv works with you to come up with a program that will fit your needs. We talk to you and ask about the people that will be coming to the private party, the venue that you have chosen, the budget you have and what you are looking to achieve. 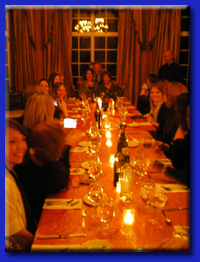 This helps us to ensure that your group will have a good time.